The original Ford Mustang shot to fame as Steve McQueen’s car in the 1968 classic cult movie, Bullitt. 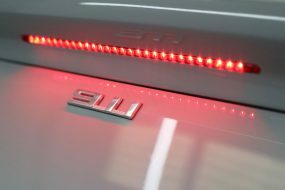 The modern version retains the ‘muscle car’ theme and slick fastback lines and with it, the undeniable ‘cool’ factor that only American muscle can deliver. In recognition of the upswing in overseas interest for the Mustang, Ford USA has finally delivered a right-hand drive version specifically aimed at countries where the population drives on the left. 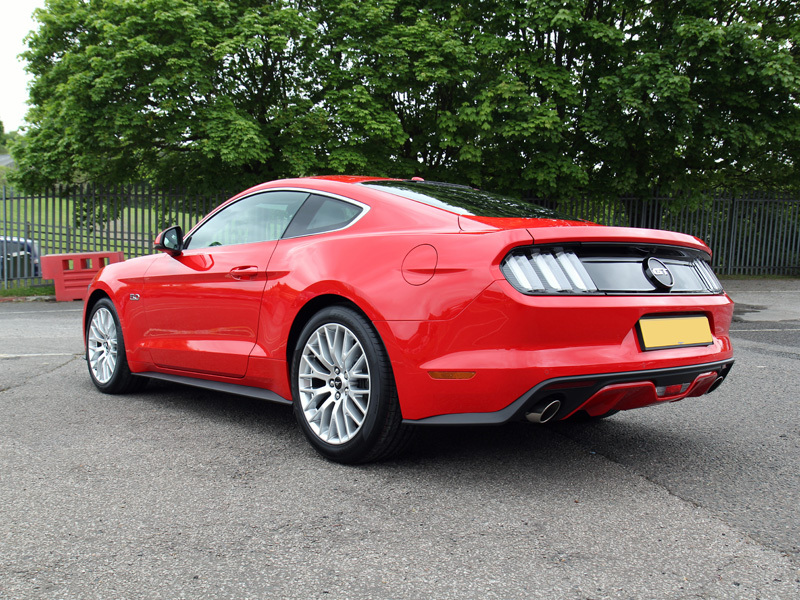 Whilst a 2.3 turbocharged engine is available, the V8 sounds incredible and as it delivers 435bhp, 400lb ft, and 0-60 in 4.4 seconds, it’s a tempting choice for many car enthusiasts! 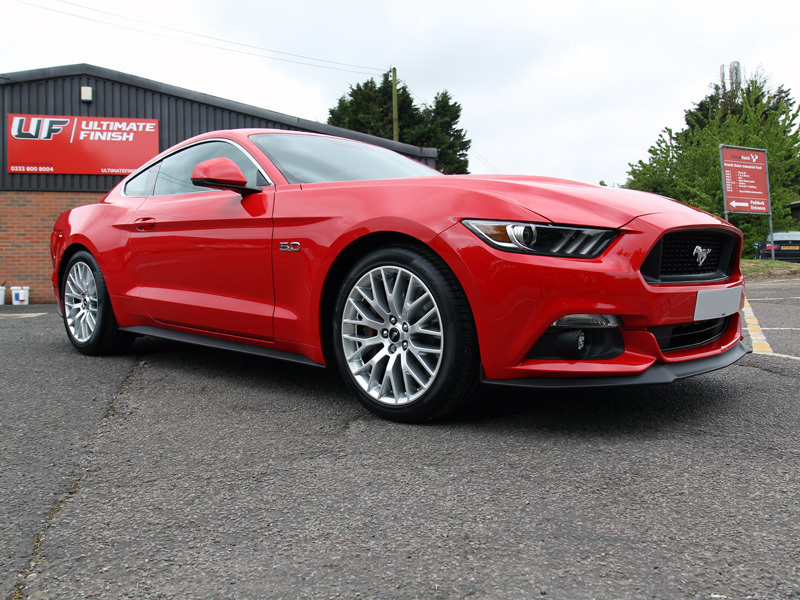 The owner of this sixth generation Mustang defined himself as a car enthusiast as opposed to a ‘petrolhead’. The Mustang has formed part of his ‘Bucket List’ ever since, when sat in a Standard 10 his first girlfriend asked what his top car choices would be, given a ‘money no object’ scenario. 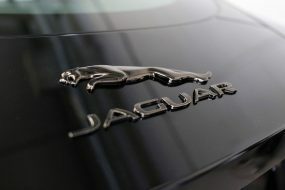 Also on the list was an E-Type Jaguar (which he acquired in 2010) and along the way, there have been a number of cult or classic vehicles, usually red in colour, including a Triumph Spitfire and most recently, a Fiat 500. Now retired and with no requirement for a city car, it was the right time to indulge and get that Mustang. Maintaining the colour theme, he opted for Race Red and waited with eager anticipation, 258 days for it to land in the UK. 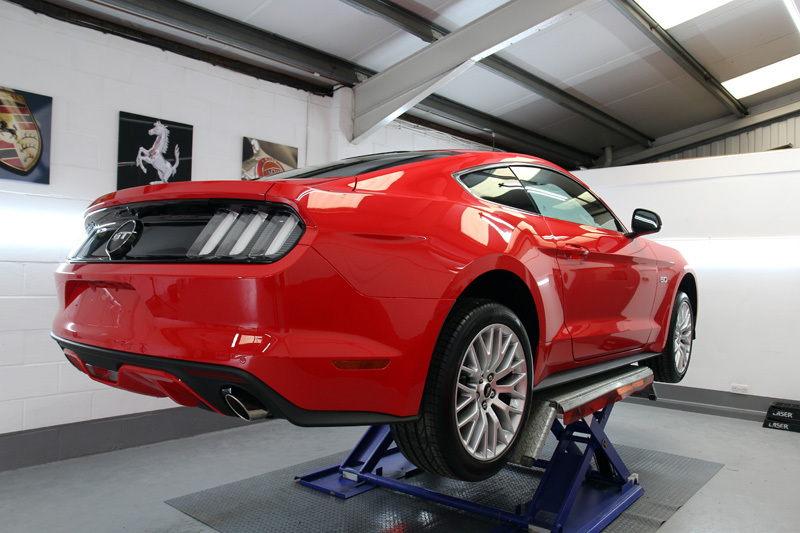 On arrival, he collected the Mustang from the dealership, and with just a few motorway miles to enjoy the burbling sound of the V8 engine and the thrill of the acceleration, delivered it to UF’s Brands Hatch Detailing Studio for a New Car Protection Treatment. 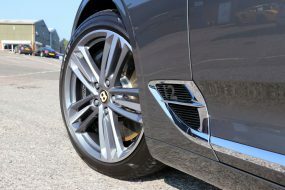 After talking through the ceramic coating options, the owner specified a sealant upgrade to Gtechniq Crystal Serum Black. 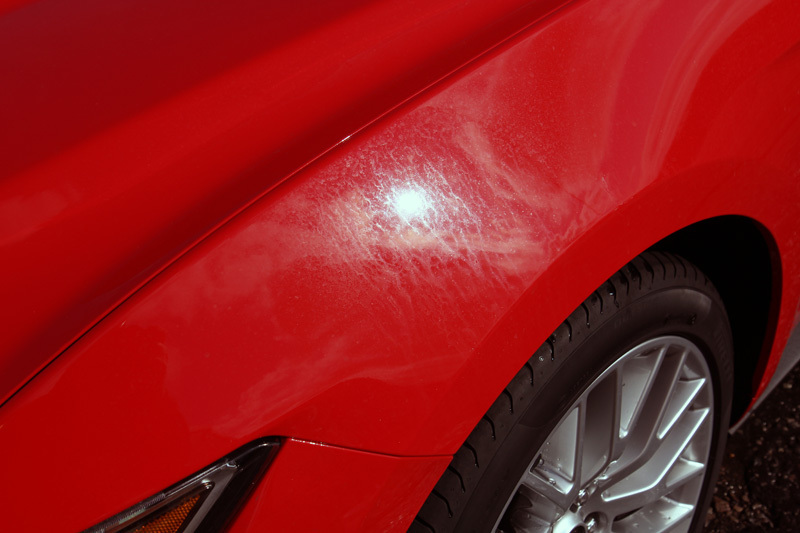 As with many new cars, the transportation wax had left a residue, resulting in dirt and grime collected during the drive to become bonded to the paintwork. Additionally, water spot marks were highly visible. There was evidence to suggest that the car had been washed at the dealership with a ‘wash and wax’ type shampoo, rinsed poorly and then left to air dry. The remnants of wax residue were clearly visible on the Race Red paintwork. 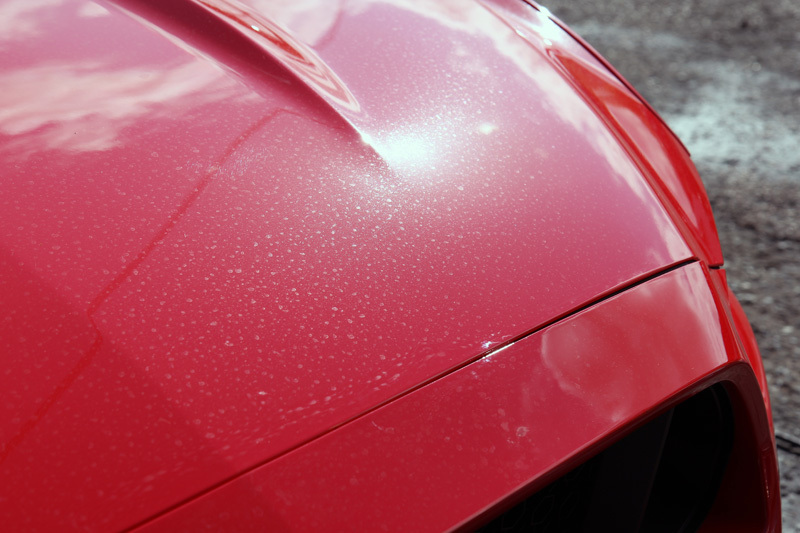 Initially, the Mustang was treated with Gtechniq W7 Tar & Glue Remover, specifically designed to break down the sticky bonds and residue left by the transportation wax. Next, using Gtechniq W6 Iron & General Fallout Remover, the bodywork and wheels were treated for iron particles which may have sheared off brake pads and even train wheels: many new vehicles are transported via rail en route to the dealership. W6 contains an active ingredient that changes colour on contact with ferrous particles. Once the colour no longer continues to develop, the solution is ready to be rinsed away carrying potentially harmful particles with it. 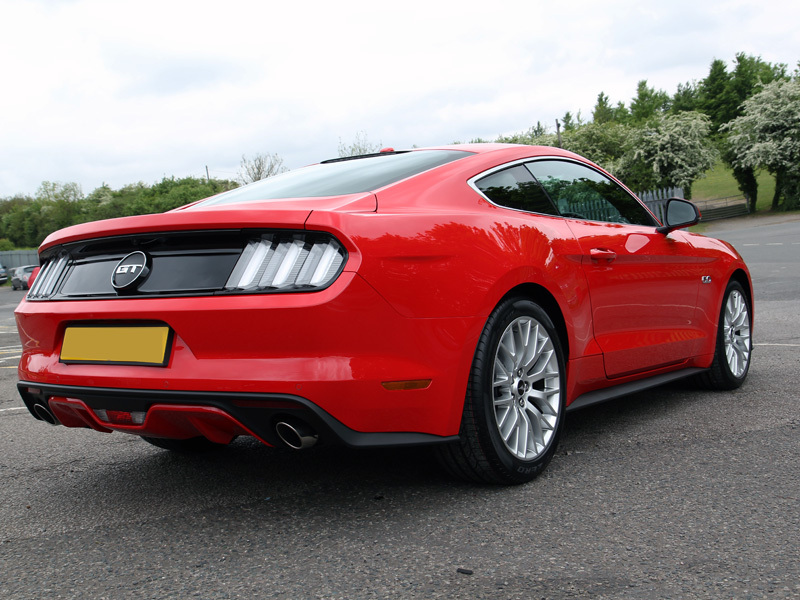 The Mustang was then degreased using Gtechniq W5 Citrus All Purpose Cleaner to remove oily residues, road grime and diesel splatters which not only cause staining but will also interfere with the final sealant if left in situ. Now decontaminated, the Mustang was pre-cleaned using Ultimate Snow Foam applied through a Kranzle-adapted foam lance attached to a Kranzle K 1152 TST pressure washer. The combination of the product and the pressure of the water creates a thick foam that clings even to vertical surfaces and lifts larger particles of dirt and grime away. When the foam is rinsed off, dirt is carried harmlessly away before a wash mitt comes into contact with the paintwork. 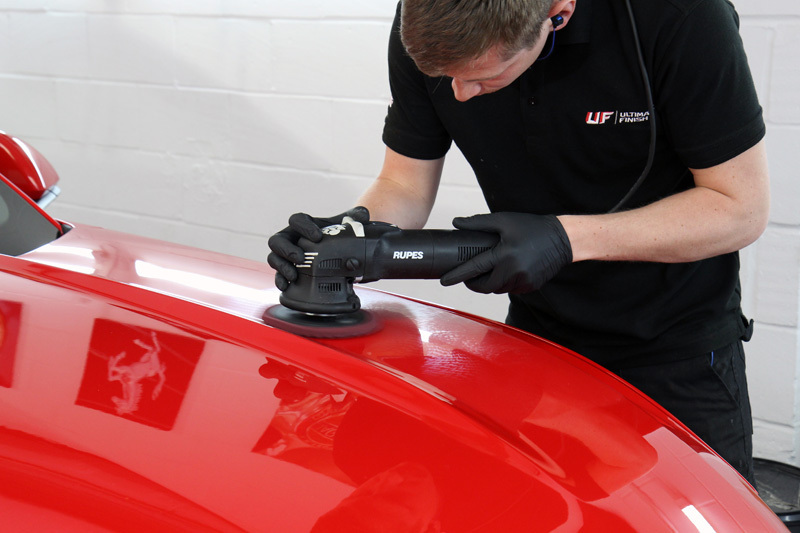 This method helps to prevent putting swirls and scratches into the clearcoat. The main wash was completed using the Two Bucket Method. One bucket contains soapy wash water, the other clean rinse water. Both buckets have Grit Guards placed at the bottom. An Ulti-Mitt Double Sided Merino Wash Mitt is dunked into the soapy water and a section of the vehicle is washed. The mitt is then rinsed in the Rinse Bucket, brushed back and forth over the Grit Guard, releasing dirt particles trapped deep in the pile. After wringing the mitt out, it is then placed back into the soapy Wash Bucket and then onto the next section of the car. 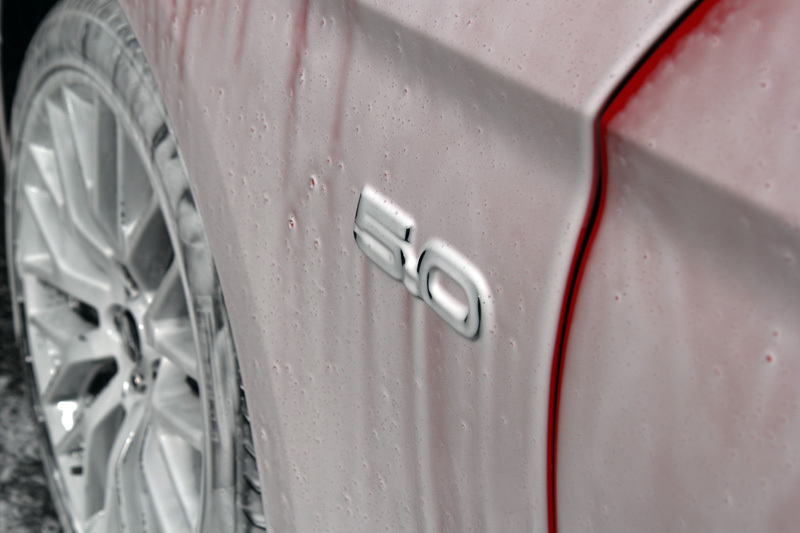 This method prevents dirt from being re-introduced onto the paintwork. After each panel had been carefully cleaned, the suds were rinsed off before an Aqua Gleam De-ionising Water Filter was attached inline with the hose to deliver a final, pure water rinse. 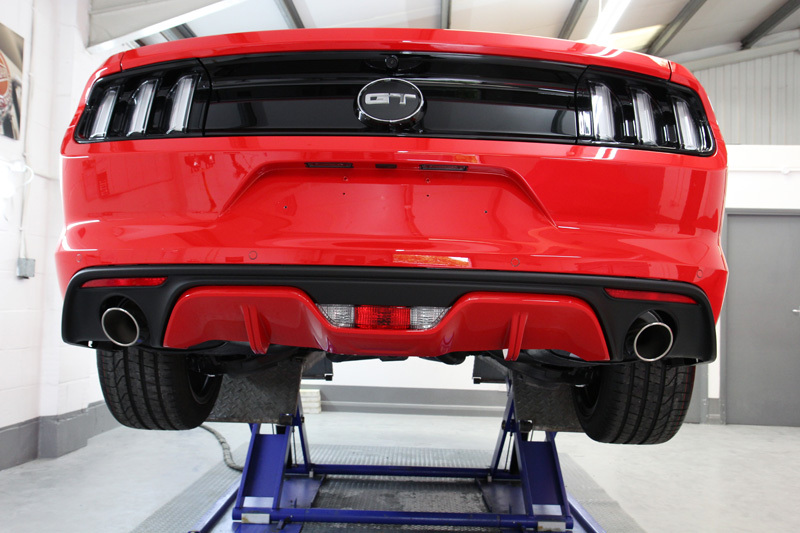 The Mustang was dried carefully using UF Ultra-Soft Microfibre Drying Towels and brought into the studio. 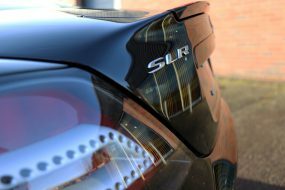 Here, the paintwork was closely inspected using a SCANGRIP Sunmatch Detailing Light to identify any swirls, scratches, scuff marks and other blemishes that may exist. Using Menzerna Medium Cut Polish 2400, a RUPES BigFoot LHR12 Duetto with a Kamikaze Collection Beast Backing Plate and a Kamikaze Collection Banzai Dynamics Polishing Pad, the blemishes were eliminated. 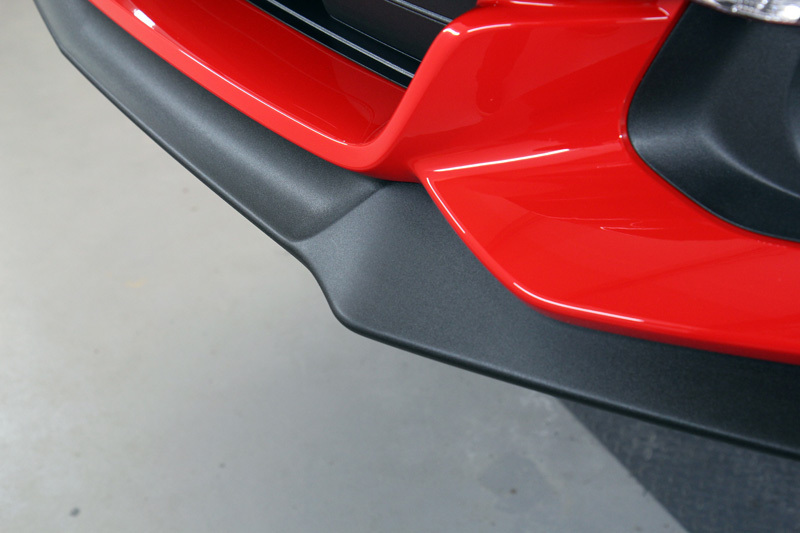 To tackle the dealership induced wash swirls on the piano black trim, Kamikaze Collection Banzai Cutting Compound was used with a Banzai Dynamics Red Polishing Pad. This was then refined using Kamikaze Collection Ichiban Finishing Polish with a Banzai Dynamics Black Finishing Pad. This combination works perfectly to leave the piano black trim a shiny, glossy black. All surfaces were treated with Gtechniq Panel Wipe to remove polish residues, leaving the surface thoroughly clean to receive the protective coating. Crystal Serum is Gtechniq’s flagship sealant carrying a 7-year manufacturer-endorsed performance guarantee. Although applied as a single coating, Crystal Serum cures as two layers. The lower layer slightly softer (around 7H on the pencil scale of hardness) provides flexibility. The upper layer hardens to around 9H and this two-layer combination provides comprehensive defence against wash-induced swirls. Crystal Serum is inherently tough and long-lasting as well as being virtually impervious to extremes of pH making it able to withstand harsh road conditions, astringent wash chemicals, as well as industrial and environmental fallout. In order to ensure maximum performance and longevity of the coating, Crystal Serum must be applied with strict observation of environmental conditions – humidity, temperature and exposure to the elements must all be controlled. As a result, Crystal Serum is only available as a service through Gtechniq-approved detailing studios. To provide additional gloss and further enhance the hydrophobic properties of Crystal Serum, a top layer of EXO v3 Ultra Durable Hydrophobic Coating was applied. Rainwater forms tight beads on contact with treated surfaces allowing it to disperse quickly, taking away any contamination contained within the droplets before it can settle. This process ensures that the car will naturally stay cleaner for longer. 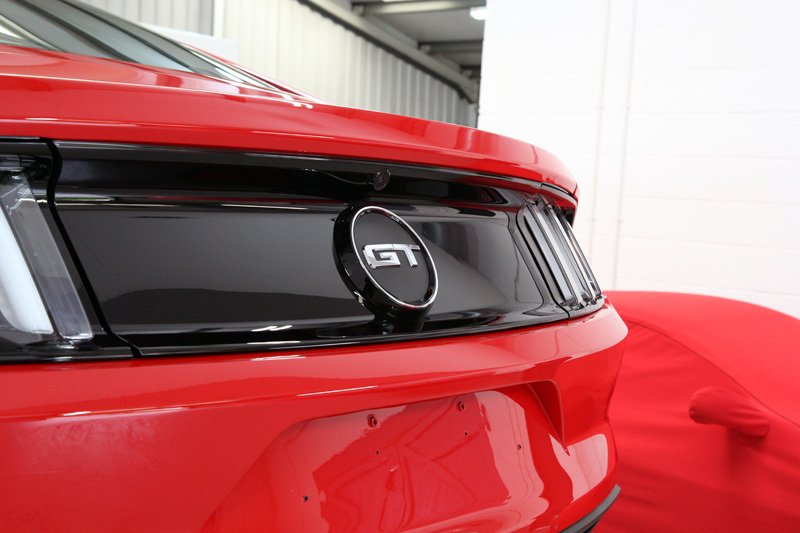 The black plastic trim was protected using Gtechniq C4 Permanent Trim Restorer, a nano-coating able to restore a deep, satin black to textured plastic trim and protect it from UV fading for up to twenty-four months. 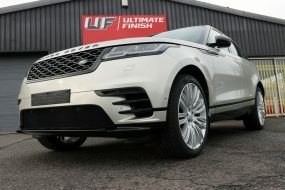 Protecting a vehicle with a ceramic coating from the beginning of ownership makes all the difference to not only the aesthetic appearance, but also to the vehicle’s potential resale value. 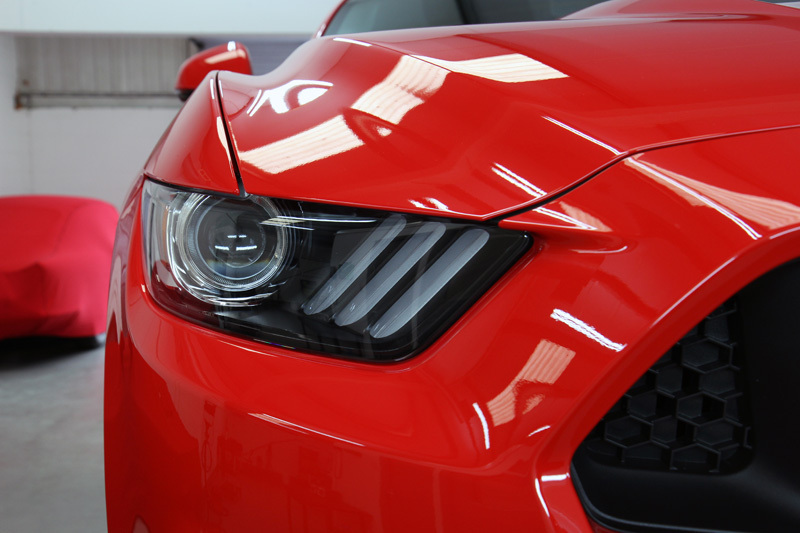 With the dual layer application of Crystal Serum Black, this Mustang will be turning heads for many years to come.